Modern electric openers include a number of safety features that are designed to make sure they don't hurt any person or object that gets in the way of your garage door. These will generally perform as an integral part of the system, and you won't really know they're working correctly until they stop doing so. Although each opener model made by different manufacturers will have other, yet similar characteristics, they are all obliged by the UL-325 regulations created in 1993 to integrate particular safety features into all of their opener models. Timers, photoelectric eye sensors, and automatic reverse mechanisms are the common methods used, and they are extremely important in order to make sure your system is safe to use. These components are essential parts of modern automatic garage door systems. 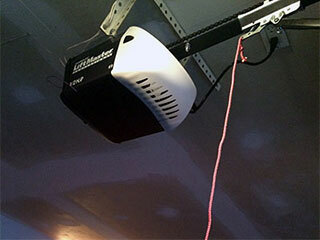 They are installed on each side of the opening to your garage and send an invisible beam across the threshold. The purpose of this beam is to alert the opener's logic board when something is blocking the opened door's path. This will cause the opener to either reverse its action, if it is already trying to close the door or refuse to close it at all. It's important to check these components every so often in order to make sure they haven't lost their position. Misaligned safety sensors can cause your door to reverse for no reason, or won't be able to properly detect an obstacle, which will be a serious safety risk. This feature serves to increase the security aspect of your home. What it does is it simply closes your door after a set period of time, in order to make sure you don't accidentally leave your home with your garage wide open, inviting all manner of pests and thieves to come right in. You can usually change how long the opener's OS will wait before engaging this mechanism. This feature serves a similar purpose as the eye sensors, but it is more of a secondary line of defense, as it were. If for whatever reason your sensors have failed to detect an obstacle and the door starts closing and encounters an object, it will automatically reverse back up as soon as it senses a little resistance. As you can see, this will prevent it from both getting damaged and damaging the obstacle that's in its way. When dealing with a problem with any of these features, it is always better to have an expert deal with the situation rather than trying to deal with it yourself. The well being of you and your family members depends on these safety ensuring features, so calling the experts is the right way to go. Contact our team at Garage Door Repair Carlsbad for more information.